Cinnamonandzoeykisses: Christmas in the Summer! I'm a total bargain shopper nowadays (believe I used to love to indulge in Chanel, MAC and YSL), but now it's just not practical. These last few weeks have been like Christmas in July (and August) for me! Back in May I was browsing blogs and was on Emeraldeyeliner.com and saw that one of the blogs contributors, Mags, had found a dupe by Rimmel for NARS Shiap! I was smitten-Schiap has been on my wish list for ages! I commented that I'd not seen them in the states and the rest is History! Well History as in we emailed and set up a swap! It was my first real swap in that we were swapping for stuff we wanted! 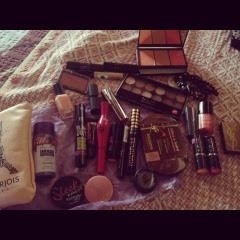 As a huge lover of UK/Ireland based blogs, I'd had a huge wish list of beauty products I wanted! Mags did not Disappoint! As I still don't have daily access to wifi, I'm only posting a quick pic- plus I'm still having so much fun with ALL the goodies I've gotten! Whew! But one more thing. That Naked palette that everyone has? And was on my wish list in July? I was able to snag it for $24. I was given an Amazon gift card/credit some time back and when I saw that Sephora supplied it in Amazon I took the plunge. It's only just arrived today- but am ecstatic! Again this is not a brag post- I'm just trying to liven up this blog! As much as I love my Bargain buys it's just nice to be slightly spoiled sometimes! And be on both ends of the receiving side! 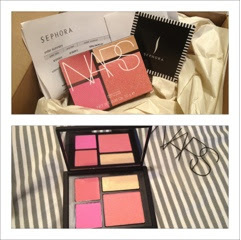 Sephora Gift Package with NARS Foreplay blush quad inside-gorgeous!! 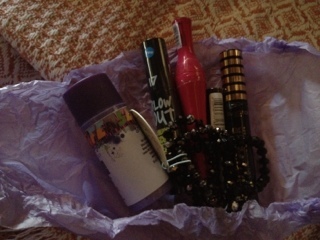 My Amazing #bloggerswap goodies all the way from Dublin! 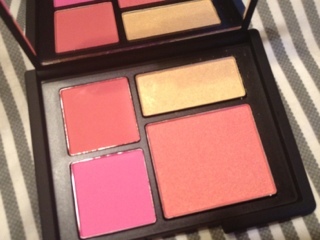 dying to get my hands on that nars palette! I've yet to try it, but NARS products can do no wrong in my eyes! I def recommend it Niki! Aw what a sweet friend to get you that gorgeous Nars palette! And I'm excited to see your reviews for all those products...I see Sleek and Bourjois--yay! Shes amazing! It's so beautiful I'm scared I use it just yet! Oh god, what can be better than all that make up? Im serioulsy thinking but I cant figure out something different!! That Nars palette looks really pretty! Awe Yessie youre a sweetie. You're a great friend and you deserve more! Thanks Carly- I have to justify it with that- but she's an amazing friend in real life and so generous!